May it be an industrial product or electronic parts that you would like to be manufactured for your business, it is important for you to develop a contract manufacturing agreement that can help you lay out the specifications of the entire transaction. Aside from examples of inventory assets, the requirements for the manufacturing processes, the intellectual rights that must be protected, and the indemnification clauses of the agreement, there are still a lot of information that you can see in a standard contract manufacturing agreement. 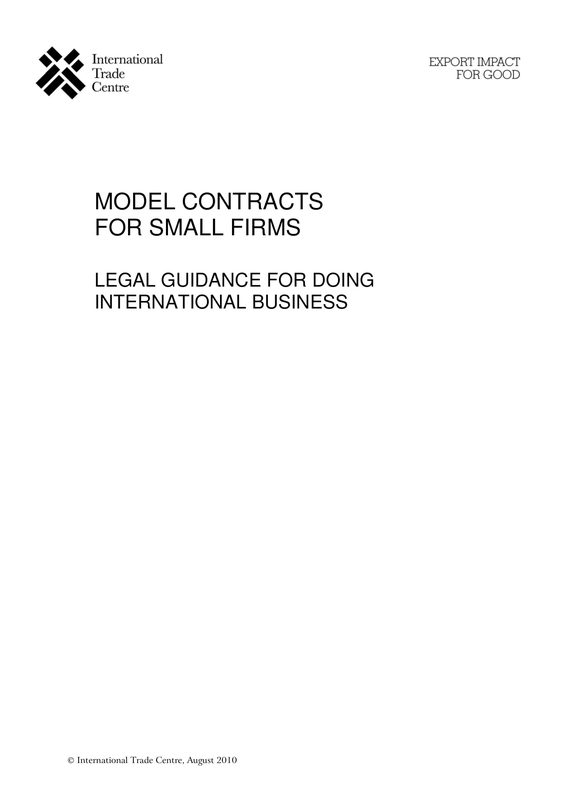 In need of help and guidance as you develop your own contract manufacturing agreement? Do not worry as we got you covered. 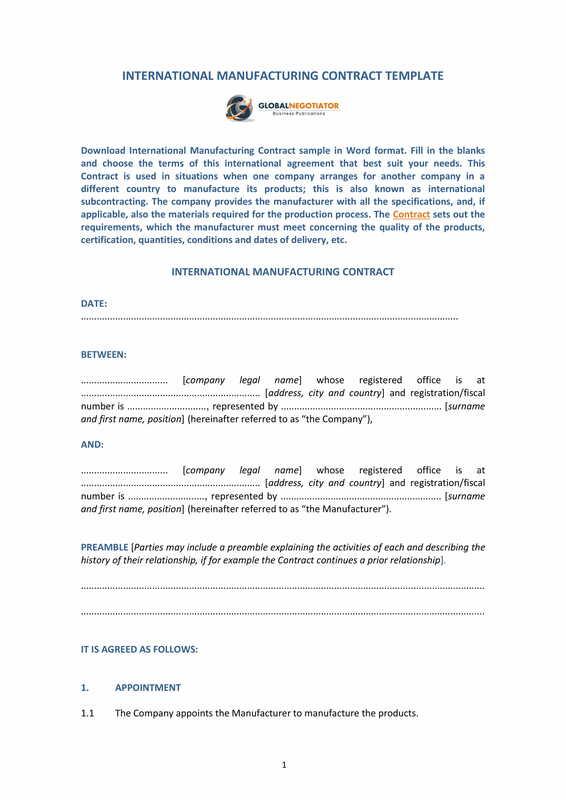 We have put together a selection of contract manufacturing agreement template examples in PDF so that you can have references for the creation of the document that you need. Make sure to browse through the printable and downloadable template examples in this post so you can be well-guided whenever you plan to start the development of the specified agreement. Why Do You Need a Contract Manufacturing Agreement? 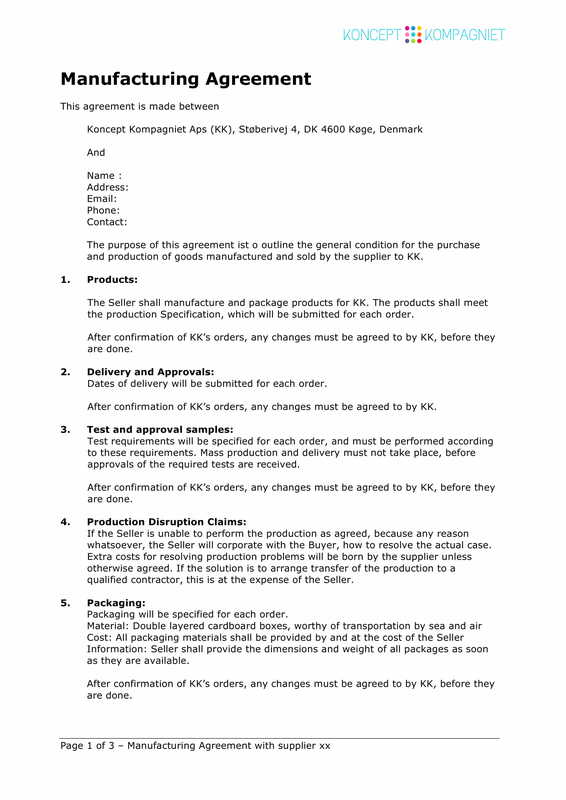 Prior to the development of a straight bill of lading for import and/or export transactions, a contract manufacturing agreement is first developed for the clarification and specification of the processes that products to be manufactured by one entity for another business must undergo. From the food and beverage industry up to the field of pharmaceuticals, there are a lot of businesses who require or demand manufacturing services. 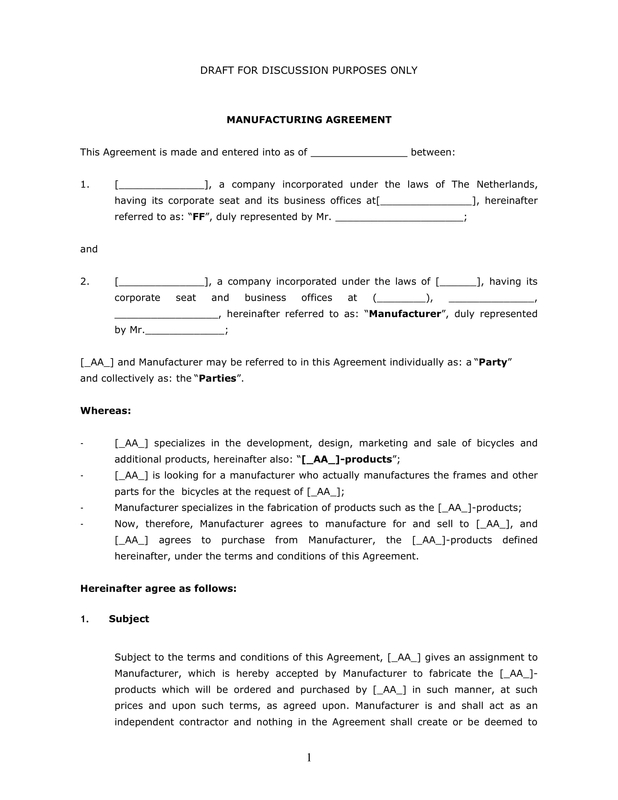 A contract manufacturing agreement is a document used whenever there is a need for one party to provide manufacturing services to another entity. 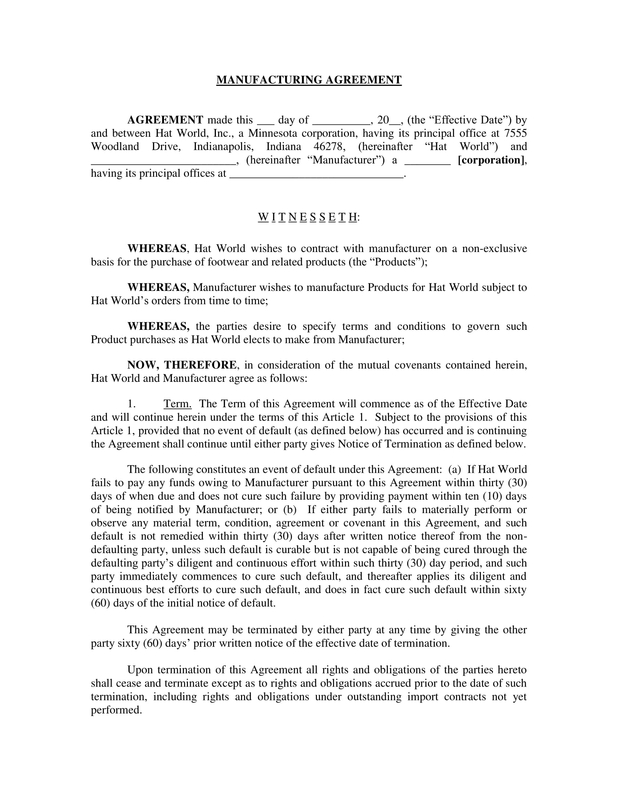 This document serves as a proof that there is a legal transaction with terms and conditions agreed upon by all parties involved. 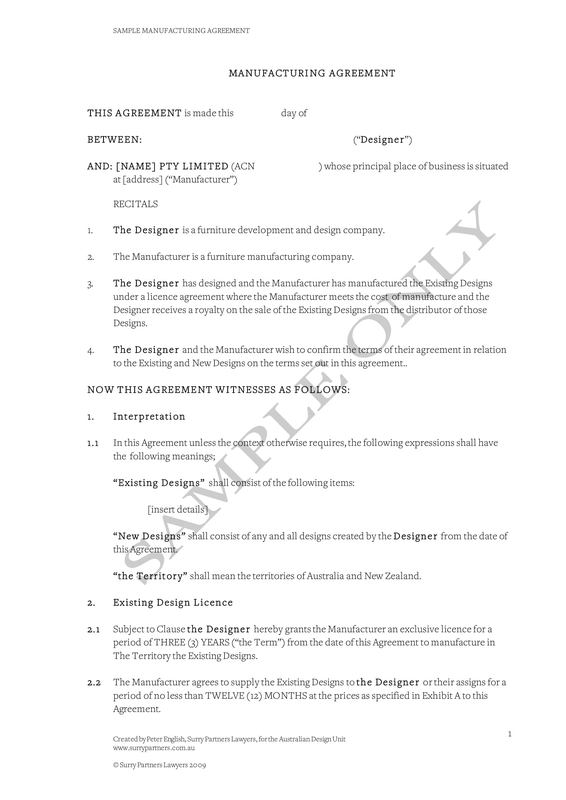 Having a contract manufacturing agreement is essential as it can be used as an evidence whenever disputes arise or occur within or even after the entirety of the manufacturing processes. 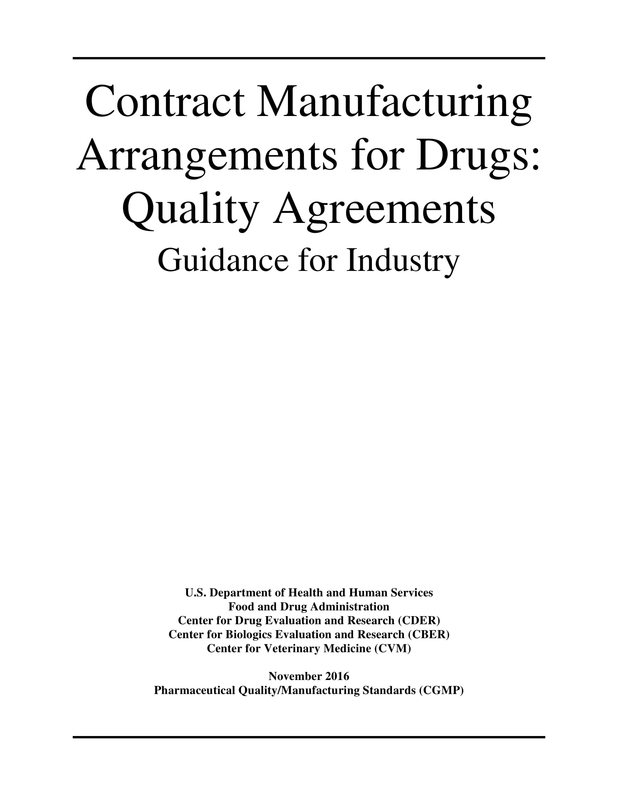 A contract manufacturing agreement usually deals with the coverage of the requirements for the manufacturing facility, the quality standards and quality measures that must be followed, the terms of the manufacturing payment as well as the total amount that is needed to be paid by the client, the management of the manufacturing inventory and other elements that are necessary to be known by all parties involved. With the help of a comprehensive contract manufacturing agreement, it will be easier to identify the timely execution of work processes and the appropriate provision of expected deliverable. A contract manufacturing agreement specifies all the responsibilities as well as the rights of both the manufacturing service provider and the client. This document is very important as it allows full understanding to the agreement that has occurred in all entities who are doing business with one another. Transparency and objectivity can be promoted if a well-developed contract manufacturing agreement will be presented and handed to all entities who will work with one another for the manufacturing of particular products or goods. 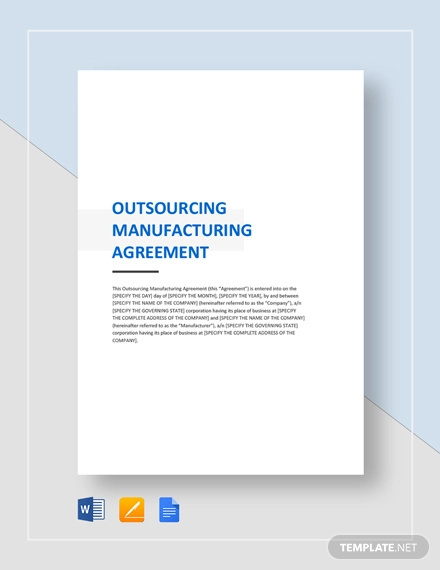 Is Your Contract Manufacturing Agreement Both Efficient and Effective? The contract manufacturing agreement must be accurate and specific. There should be particular numbers that are assigned for the quantity of the products to be manufactured as well as the parts that are necessary for all the areas of each product to be complete or properly put together. Your contract manufacturing agreement is expected to be direct to the point. This is very important especially when discussing the terms and price of the entire transaction as well as the specification of the amount that the manufacturer and the business have agreed upon with regards the provision of a variety of manufacturing services. The contract manufacturing agreement must properly present the rights and responsibilities of the manufacturer and the business. As an example, developing an effective idea for a product that businesses can be known for is not enough. For a business’s product vision to be realized, the product idea must come to life. This is where the help of a manufacturer enters and becomes beneficial. Since manufacturing service providers are also businesses, you have to make sure that the production of your products and/or goods will be credited to them but the brand, intellectual rights, and label will still be in your ownership. 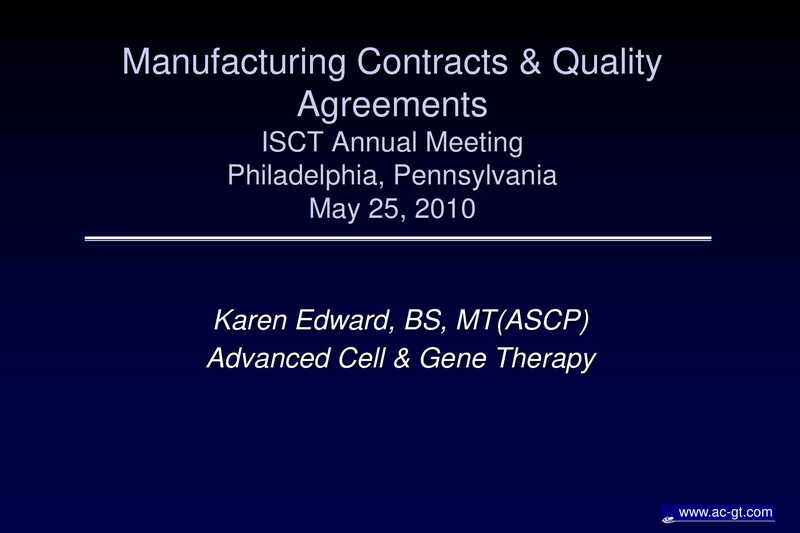 The contract manufacturing agreement must be a presentation of all the items that all parties have already agreed upon. From the maintenance contract as well as the mode and means of product delivery up to the listing of deliverable and inventory, the contract must have a statement of agreement and affixed signatures to solidify the validity of the document’s content. 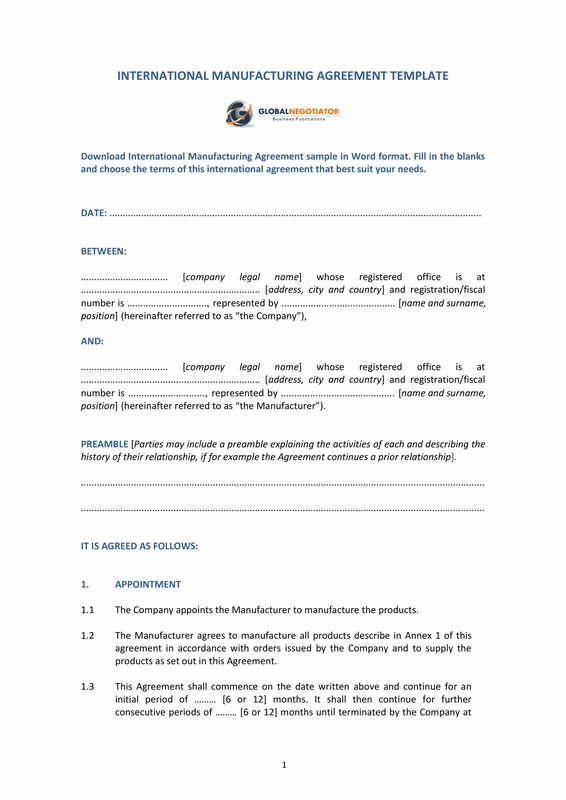 When creating a contract manufacturing agreement, you have to identify whether you will let a manufacturer handle the entire processes of manufacturing the product of your business or you will just hire them to execute services for particular areas of production where their expertise and help are needed. If you are going with the latter option, it is essential for you to list down all the production and manufacturing activities where the involvement of the manufacturer is deemed necessary. As you develop a contract manufacturing agreement, You have to look into the precision of your discussion. Ensure that you will be dealing with firsthand and credible information so that you can protect the intentions of your business while making sure that you will also be particular with your obligations and responsibilities. The entire contract manufacturing agreement will be scrutinized and browsed through by all entities involved in the manufacturing agreement, which is why you have to come up with a document that is credible enough that it can promote a healthy business relationship to all entities. When making a contract manufacturing agreement, you have to be aware of the significance of the transaction’s benefits and advantages. For one, contract manufacturing can help your business save money and other resources related to labor, material usage, and expense allocation. Anything that is relevant to production cost and manufacturing services must be properly observed so that you can come up with a functional document that can maximize your efforts and manufacturing transactions. If you plan to use a contract manufacturing agreement, you have to make sure that other supporting details and documents are attached in the agreement or handed all together to the parties involved in the transaction. It is important for manufacturers and businesses to have an idea about the inventory spreadsheet that will be used, the manufacturing procedures that will be done, as well as other functions and areas of manufacturing that will allow the desired product to be made. Since contract manufacturing deals with outsourcing, all necessary information and documents must be properly put together for ease of use. Make sure that you will properly set out the terms, limitations, and scope of the transaction. This means that you have to present your expectations from the manufacturer who is tasked to manufacture your product as well as the specific demands for the procedures that the product that will be manufactured must undergo. The complete listing of your requirements can help the transaction smoothly flow. 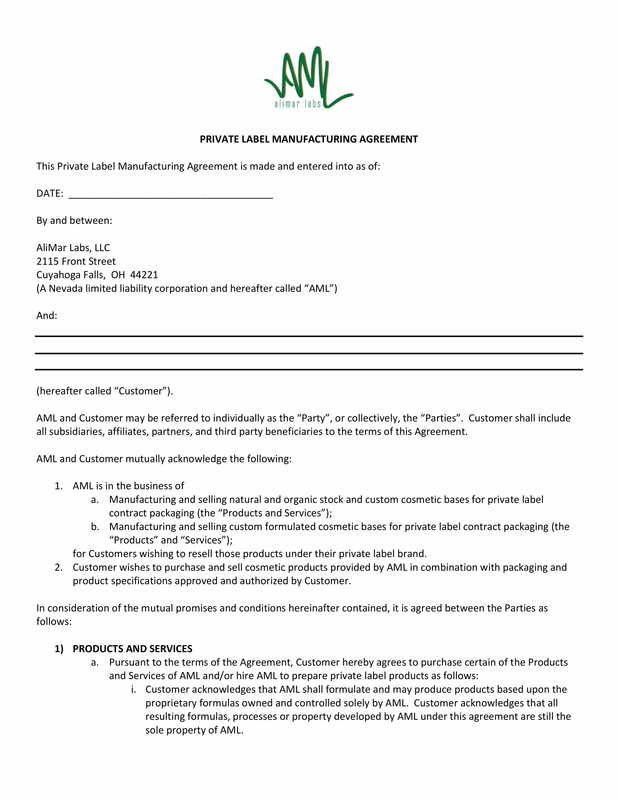 Since a contract manufacturing agreement is a legal document that presents the agreement between two parties, it is important for legal and lawful definitions of terms to be clarified. There is a need for the document to be as understandable as possible so that misunderstandings and relying on misleading information will not occur. This can help protect the relationship of the manufacturer with the business who has developed the product that will be manufactured. Ensure that you will be particular with the inclusion of different clauses, terms of agreement, and legal specifications. As an example, you have to be critical with what you will include in the mutual confidentiality agreement that you will incorporate in the manufacturing contract. Being able to focus on this can help you ensure that you and the business that you are transacting with are on the same level or phase when it comes to the protection of the confidentiality of the manufacturing transaction. 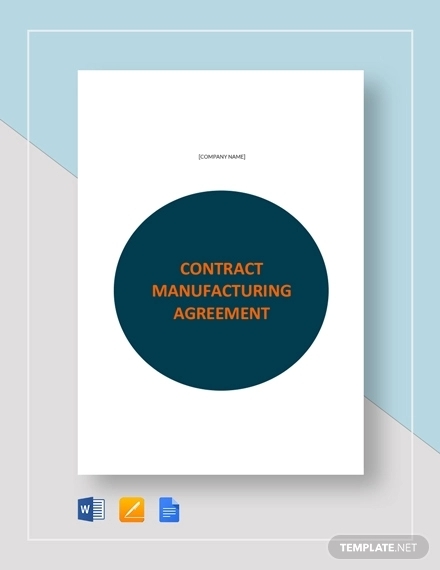 Browse through the entire content of the contract manufacturing agreement for a number of times so you can make sure that the document is error-free, complete, and presentable. Observe how the format that you have selected to incorporate in the document can affect the discussion flow. Make necessary changes for the agreement’s development or improvement the soonest time possible so you can create an impressive document. Again, do not forget to download the template examples that we have listed in this post and make sure to be reminded of the guidelines and other relevant discussion that we have specified. With all of the references made available for your disposal, try to draft your own contract manufacturing agreement anytime from now on.